Google Penguin has had a significant impact on the entire online world. Companies who used to use search engine optimization and technical ways to work around Google’s algorithms to send their websites to the top of the search rankings are being squeezed out of the market. Many businesses have lost their livelihood overnight as their old SEO techniques have shot them down hundreds of pages in the rankings. If your site’s rankings have gone down since the introduction of Penguin on April 24th, it is time to take a careful look at your website’s inbound marketing strategy. Here are some tips to help your site recover from the impact of Penguin. 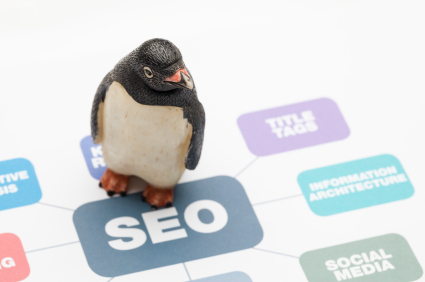 Before Google Penguin it was considered enough to limit your keyword saturation to around 2-4%. Now, Google also considers whether keywords appear as meta-keywords, sidebars, H1 tags, or in the title of your page. If you are doing this, it’s time to back off, before you get penalized for stuffing keywords. After Penguin, we are recommending that no more than 2% of all your inbound links contain any of your primary keywords. We’ve said it before, and Penguin is making it crystal clear: connecting with your customers through social media will help you earn rankings. Make the most of social sharing on Twitter, Pinterest, and Facebook to actively engage your users with your brand. It will also help you build trust with your existing customers and potential new ones. And, Google will see links created through these kinds of social sites as unforced, natural links. Companies who used to buy links with text that matched a certain search term are learning that they just can’t do that anymore. Think of links as your editorial votes. The more votes your website gets, the higher you should rank. Google Penguin looks at the relevance, quality, and quantity of sites that link to you. They analyze how quickly your site was linked to and the anchor text linking websites use. Make it your goal to encourage a high diversity of link types from a diversity of domains. Your site’s ranking will be penalized for unnatural links that are obviously paid for, including links that use text matching your anchor text, comment spam links, guest posts on sites that focus more on link text than content, and links from dangerous sites that have been red-flagged for pop-ups, malware, or other issues related to spam. The most important thing you can do to improve your post-Penguin ranking, is to update your website every week with new content. Once you find your business’s niche, develop it with articles, frequent posts to your blog, and other information your customers will find interesting. By offering your readers genuinely informative content that isn’t just space-filling words spun from other blogs, not only will your site be miles ahead of your competitors, but it will generate real conversation (and links) far more valuable than anything site optimization or SEO can do. Sure, that sounds easy, but what can you do to improve your writing (and make it less likely to anger the Penguin)? Most importantly, you should build your articles and blog posts around real problems and provide real solutions. Do as much research as you can. Read everything you can find on the topics that interest you, and then sit back and think about how you feel. Bring your own views to everything you write, don’t just spin what you have read somewhere else. And, finally, write with a compelling voice that will communicate to your readers that you are more than well informed; you are passionate. We believe the Google Penguin update is for the greater good of the Internet. Google wants companies that market online to focus on quality content that is keyword rich. This includes your website content, and most importantly, blog posts! Look at it this way: if you’re not “giving back to the internet” by contributing valuable content, you will no longer be able to earn a top spot on Google. PreviousPrevious post:Does Your Design Deliver What Your Customers Want Most?NextNext post:Want Social Media Engagement?